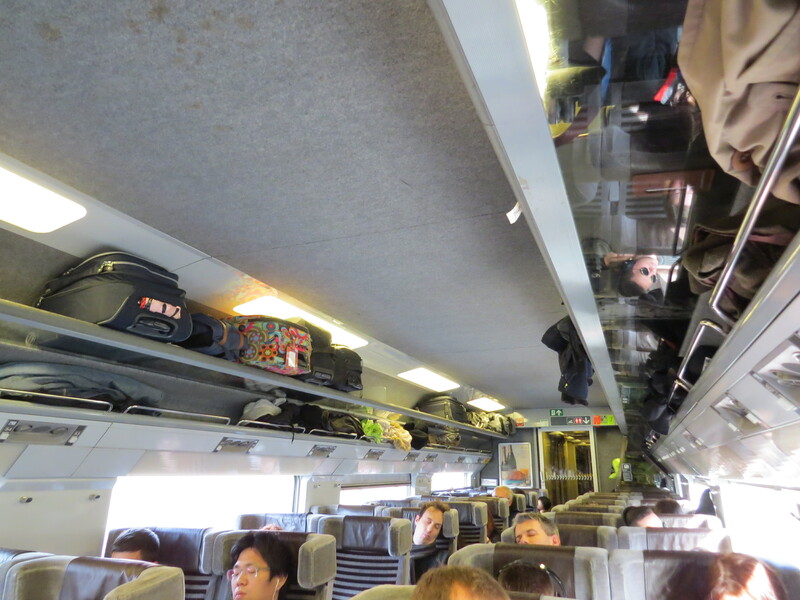 Today we took the Eurostar train from Paris to London, going through the Chunnel. Our rail journey lasted about two and a half hours, and it was a simple and pleasant trip. The Chunnel — the tunnel that runs underneath the English Channel — makes traveling between these two popular tourist destinations so much easier! 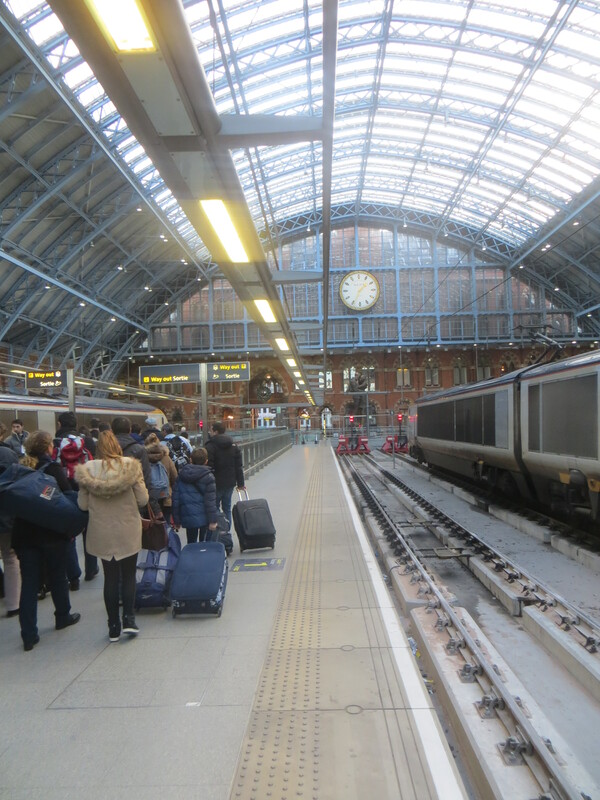 The train leaves from the Gare du Nord station in Paris, where you fill out your entry form, present your passport, and clear customs into Great Britain. You wait in a reasonably nice waiting lounge, where duty-free shops line one side and you can get ridiculously good and reasonably priced food — particularly for a place that is serving only captive customers who don’t have any other dining options. When boarding time comes you file down the station ramp to your rail car, board, find your assigned seat number, then place your luggage and coats on the shelves above and settle in for the ride. The seats are comfortable, the swaying of the train is soothing, the ride is virtually noiseless, and most of the passengers spend the trip sleeping as the train zips along. 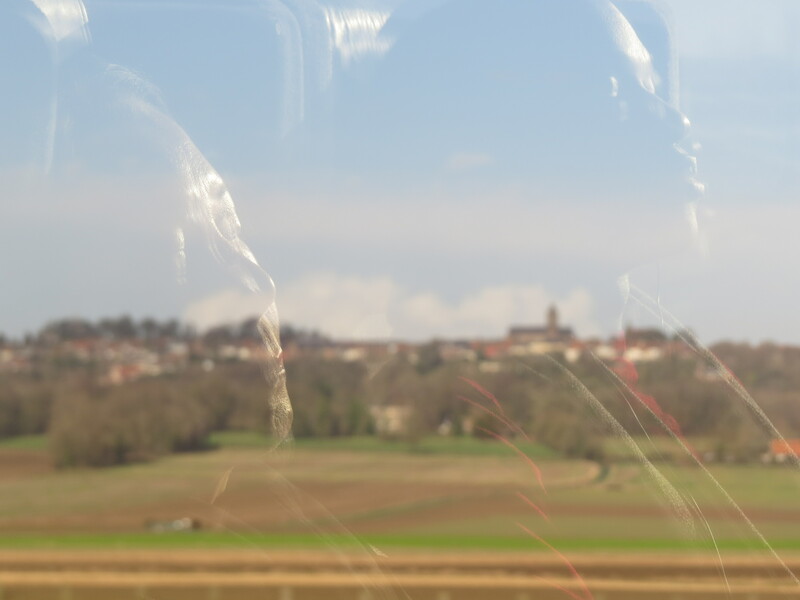 The rolling French countryside is pretty, and there are a number of quaint little towns and churches along the way, but the temptation to nod off for at least part of the trip is irresistible. 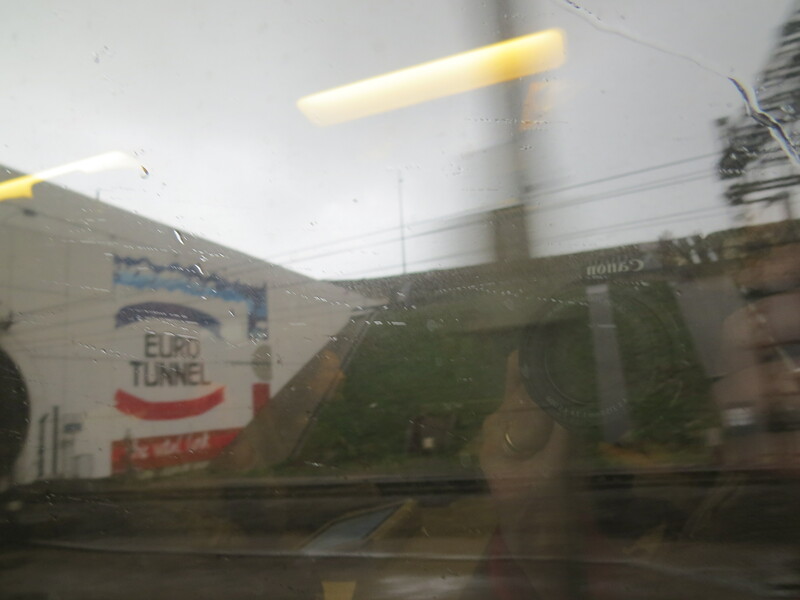 Not surprisingly, the weather turned dark and rainy as we approached the English Channel, then we flashed by a “Euro Tunnel” sign and we were in the tunnel itself. It’s a dark tunnel like any other, except that it extends, amazingly, for more than 20 miles. The passage through the tunnel takes about 20 minutes, and when we emerged on the other side it was sunny and bright. Within a very short period we were pulling in to St. Pancras station on the outskirts of London and Scrambling to grab our bags, catch a cab, and head to our apartment in Great Britain’s capital city. I can’t speak to the Chunnel as a technical engineering accomplishment, aside from recognizing that digging a tunnel that is more than 20 miles long, under a stormy body of water, is a monumental achievement. I also can’t adequately capture the Chunnel’s geopolitical significance, either, other than noting that it links two countries that were at war constantly during the centuries from 1300 to 1800 and ties that Sceptr’d Isle to the European mainland. But I can say that, as a traveler, I deeply appreciate the convenience of traveling from France to England by train, without taking a ferry and worrying about the notoriously bad Channel weather.